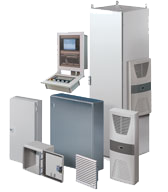 HTE Technologies offers a comprehensive range of enclosures, structural framing solutions, and cooling components, allowing your equipment to operate at optimum efficiency. Our selection includes server racks, aluminum extrusion enclosures, server enclosures, control consoles, stainless steel enclosures, climate control products, as well as a range of compatible accessories. Our TECHTEAM can assist with developing an enclosure or climate control solution that would work best in your facility – from compact cases and enclosures to entire enclosure systems. TECHTEAM specialists are available to assist with design, installation, and ongoing support, ensuring you choose the product that will result in the highest efficiency, quality, safety, and flexibility. Representing the global leader, Rittal, our array of cooling components, structural aluminum extrusion products, and enclosure systems is an ideal choice for a variety of industries. Automotive, energy, information technology, and food and processing are just a few of the industries that require these types of products. For an optimal level of corrosion, machine and surface production, HTE has a solution to fit your needs – or we’ll develop one for you! From simple parts for industrial enclosures to advanced cooling concepts, we have a product in our collection to assist with any application. HTE is your resource for enclosures, panels, and cooling needs if you are located in Kansas, Missouri or Illinois.